Jack Lawrence has been called a “flatpicking powerhouse.” His recordings and performances combine exciting, high spirited and innovative guitar solos with tasteful phrasing in his own inventive style. 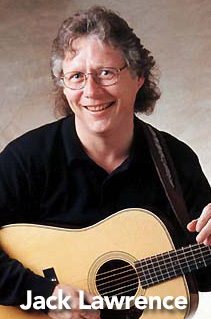 Well known as Doc Watson’s partner since the early 1980’s, Jack’s inspired playing and smooth vocals provide listeners with performances that span musical traditions. Jack grew up in Charlotte, North Carolina and his musical odyssey began at age ten when his father took a job as sound engineer for a local music hall. Backstage at the Lake Norman Music Hall, Jack had access to many of the top acts in the Country, Bluegrass and Gospel fields as well as the local R’n’B bands. As a youngster, Jack took this opportunity to meet and learn from some of the finest players in the business. Performers of the day such as Buck Owens, Don Rich, Bill Monroe, Leon Rhodes, George Shuffler, and Flatt and Scruggs exposed Jack to a variety of styles emerging in the 1950’s and 60’s. From these early experiences, Jack developed his own talents and found his major influences to be Doc Watson, Clarence White and Django Reinhardt. By the late 1960’s, Lawrence was playing in local Folk and Bluegrass groups and soaking up as much music on the professional level as possible. An after school job with luthier C.E. Ward in Charlotte proved a tremendous learning ground for the sixteen-year-old. Through Ward’s association with Bluegrass Gospel legend Carl Story, Jack started doing guest spots on Carl’s TV show and making other public appearances. In 1971, three days after his high school graduation, Lawrence set out on his professional career.Jack’s professional experiences over the next several years provided a wealth of opportunity and associations that continue to fuel his talents today. In the fall of 1971, Lawrence joined one of the pioneer bands of modern bluegrass, The New Deal String Band. Within months, he was off to Louisville, Kentucky to join forces with The Bluegrass Alliance. After a second stint with the New Deal String Band, Jack spent several years honing the electric guitar playing in rock and country bands. In 1978, Jack tired of the rock scene and he teamed with Joe Smothers in a relaxed folk duo. Smothers and Lawrence successfully toured and recorded throughout the country in the 1970’s and 80’s. Through Joe, Jack met Doc and Merle Watson and he began to tour with Doc in 1983 as Merle pursued other interests. Since that time, Jack has been playing side-by-side with Doc and the opportunity to partner with one of his most important musical influences has been an infinitely rewarding experience. Over the years, the two musicians have developed a brilliant guitar partnership, capitalizing on both their strengths. Lawrence tours extensively with Watson and also as a solo artist throughout the US and Europe. Jack’s talents are featured on many of Doc’s recordings, including the Grammy winner “On Praying Ground.” The solo project “About Time,” released in 1997, showcases Jack’s amazing guitar style and rich, warm vocals. In 2001, he assembled some of the friends he most admires for an exciting recording project. These sessions resulted in the April 2002 release of “I Don’t Need The Whiskey Anymore” featuring Sam Bush, Jerry Douglas, Tony Williamson, The Del McCoury Band and, of course, his old friend and partner, Doc Watson. Running the gamut from “Honky-Tonk Bluegrass” to “Gut Bucket Blues,” this recording documents Jack’s musical influences such as Doc, Mississippi John Hurt, Bill Monroe, Flatt and Scruggs and the Allman Brothers.Jack has three children  now grown-up or “nearly” grown and he is very proud of Matthew, Adam and Jenny. Jack lives in Harrisburg, North Carolina with his wife Katie.